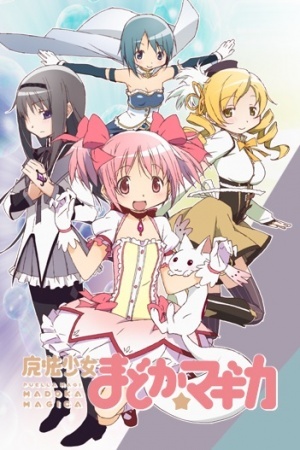 What it’s about: Madoka Magica begins with the standard “Magical Girl anime” set-up – the moral and upstanding Madoka is approached by two strangers. The first is an adorable-looking alien named Kyubey, who offers to fulfill any wish a teenage girl might have, provided that she’s willing to sign on the dotted line and risk her life fighting against strange and dangerous beings known as “witches”. The second is a mysterious girl her own age named Homura, who strenuously warns Madoka against taking up the offer. Why you should watch it: Madoka Magica is one of the most highly-rated anime series of all time, and for good reason. It’s often called a deconstruction of the magical girl genre, though there’s some argument as to how accurate that description is. Whether it is or not, after the show gets going, the brakes come off the train as the plot careens towards an action-packed conclusion, with a massive amount of character development stuffed in along the way. The package is completed with a gorgeous soundtrack and a unique approach to animating action sequences that makes this an incredibly memorable series. Caveats: This show is the reason for the standard recommendation that people try out several episodes of a show before deciding whether or not to finish it. Also, once you strip away the thematic elements that define the show, it is at its heart a Magical Girl series. If you’re utterly unwilling to countenance watching it based on that, then, well, fair enough. Themes: Utilitarianism. Faustian bargains. Hope, despair, and sacrifice. Some see Buddhist or Christian overtones. Similar works: Anything by Gen Urobuchi (Psycho-pass, Fate/Zero). Steins;Gate. Selector Infected WIXOSS tries to do for the “card game anime” what Madoka did for the Magical Girl genre. If Madoka *does* get you interested in seeing other decent Magical Girl shows, give Revolutionary Girl Utena or Yuuki Yuuna wa Yuusha de Aru a go.